Looking to save money on your kids birthday party? Yesterday my co-worker was bemoaning the cost of his girl’s birthday party, apparently his wife went a little overboard and could have used a few tips on cheap party ideas, so I decided to share a few from the recent Star Wars birthday we put on for our son. We didn’t actually set out to save money on the party, our house is on the market so our main concern was keeping it clean over the weekend. However, some of the things we did as a result ended up saving us money! We knew we didn’t want to host the birthday party at our house so we could keep it clean, however, the cost of renting a place to have a party was more than we wanted to pay. We ended up going to a local park, keeping the messy kids fingers off the furniture & windows but not having to pay to rent a birthday spot. One thing to keep in mind if you have birthday party at the park is to pick a park or a spot in the park that’s close to cover in case it rains and has some nice trees to shade the kids and parents from the hot sun. Another plus is a spot that’s close to a parking area so you don’t have to lug your stuff too far. The birthday cake is usually at the center of a child’s birthday, what’s a party without cake & icing right? However, the cost of cake can also eat up a big part of your kid’s birthday budget. Baking your own cake can save you some money, it’s definitely cheaper than buying it from the store. If your kid wants a fancy themed cake that’s beyond your icing skill level, one option is to buy some themed decorations from a site like Etsy and use those on top of the cake. Another tip that can save you a little more is to make birthday cupcakes instead of a full cake. This means you don’t have to buy plates and utensils for the kids since they can just eat the cupcakes with their hands. We did this since we were going to be at the park and it meant less stuff to carry, but it also saved us some money as well. Your food costs will also be impacted by the timing of your child’s birthday party. If you schedule the party for dinner time you’ll spend a lot more on pizza, burgers, or whatever you buy or cook up. Set the party for after lunch and before dinner time and you’ll save money on birthday party food. When you’re buying for a big group you can usually save money if you buy in bulk. We used our Costco membership discount to buy water, soda, and Capri Sun’s for drinks and a variety of snack foods. For our boy’s birthday party, it wasn’t really a party in his mind until there were balloons. If you buy the themed balloons (with their favorite Disney character) those can get pretty expensive. Instead, we stuck with solid colors and let him pick the colors of the balloons he wanted. We decided he could get as many balloons as years he was old; four big helium balloons from the supermarket flower store only set us back $5. If you don’t want to spend the money on helium balloons, for the same price you could also buy several packages of regular balloons and blow them up yourself. Another way you can save on birthday party decorations is to buy them from other crafty parents instead of party stores. We found some cool and cheap star wars decorations for his party on Etsy. Rather than buying games to keep the kids busy you can come up with your own birthday party games. For example, instead of spending money on the classic “Pin the Tail on the Donkey”, my wife made her own “Pin the Light Saber on Yoda” game. Neither of us are great artists but she found instructions online on how to draw Yoda, a character from the Star Wars movies. Trying to draw something like that from scratch probably wouldn’t have turned out very well but the website she found gave detailed step-by-step instructions on how to draw each part of little Jedi. She got out a big blank piece of paper and after about 15–20 minutes she had drawn a life-sized Yoda. 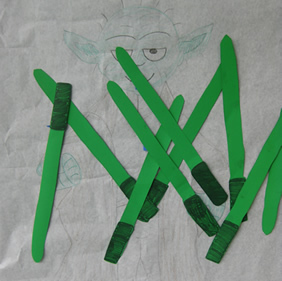 Then we cut light sabers from green construction paper, one for each kid. Yoda was was taller than all the kids at the party, we taped him to the top of a card table, leaned it up against a tree, and the kids played “Pin the Light Saber on Yoda”. We spent money on putting together birthday gift bags for the kids but it turns out we didn’t really need to thanks to a cool Star Wars party gift idea my wife found on the web. 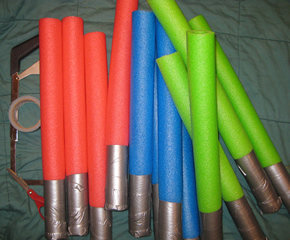 We bought foam noodles, cut them in half, wrapped the bottom in duct tape and each kid had their own foam light saber. There were several different colors to pick from, each kid got to choose which color they wanted and we wrote their name on it with marker. The light sabers were a huge hit, they kept the kids entertained the whole party, chasing each other all around the park. Not only that the kids got to take them home to play with after the party; we later found out that one little girl liked it so much she wanted to take her light saber to bed with her that night. You don’t have to buy thank you cards to send out after the birthday party. We had our son make the cards himself, not only did it cost less it was a little more personal. He can’t write yet so he just colored on some paper and my wife wrote a little note on the inside. Saving money on a birthday party doesn’t mean that it won’t be fun for your kid. It might be a little more work for you but they’ll have just as much fun and you’ll have a smaller credit card bill. Obviously some of these tips will save more than others but all together they can save you a lot of money on your kids birthday party. Enjoy the party! Making your own cake is okay if you have a few guests. Making your own cupcakes is a lot more work than making a whole cake – just go to any bakery and compare the price of 30 cupcakes vs. a cake for 30. Walmart, BJs or Costco offer great discounts on food and cake. For my sons’ avengers theme party, I bought a 2-tiered cake with the 4 avengers characters on them for $40. That cake would have taken me several hours to bake and decorate. The $40 was definitely worth it. My biggest tip is keep the party simple – simple but filling food, simple favors, make your own games that are not overly complicated. Internet searches will give you so many ideas for any theme party you want. These are great tips and for some people they are wonderful ideas. But few people have the time to put all this massive effort into a child’s party. Not everyone is good at handling the entertainment part or the organizational part of a do-it-yourself party. These suggestions are not altogether “cost free” so I would always do a cost comparison between “the do it yourself” and the “pay one price for parties where food and entertainment are taken care of”. Sometimes it can be cheaper to go with “pay one price parties” when you add up the value of your time and other expenses(direct and indirect). It also tends to relieve you of anxiety caused by wondering if the weather will cooperate and/or whether you will be able to pull off the entertainer-for-a-day role with grace. Add it up, then compare in order to make the best decision for your family. You mentioned some great tips. It’s amazing how quickly the cost of a part can shoot upwards – even a child’s party. I agree with most of what you said. But number 4, Come on now, Serve Snacks, Not a Meal. Screams out to me, Come give my kid a gift and get lost. If you are having a party and people are expected to bring a gift. You must provide a meal. There is fugal and plan Cheap. You do not need to feed me lobster and beer. Hotdog / hamburgers and pop is fine by me. IMHO if you can not afford to feed your guest then you can not afford a birthday party. You’re right. There’s no reason to go broke over a birthday party! I have a kids’ party theme ideas site and I like to point out options for all budgets. Ben, you bring up some helpful tips. I don’t have children of my own yet, but this looks like great advice for parents out there looking to throw a party for their kids. Speaking from my childhood though I can definitely say while I had a lot of fun at the laser tag parties, it was the parties that had their own party games that I enjoyed and remembered the most. So I think that #8 is a really awesome idea for saving money and creating memorable parties for the children. Do You Snoop on Your Neighbors?